Girls in central Khartoum. Photo: Morwan AlKanzi. In early January 2018, a video emerged and spread widely on Sudanese social media, appearing to show a vice-chancellor of Al-Ahfad University – a private women’s university in Omdurman, Sudan’s second largest city – physically assaulting female students. The video appears to show Professor Gasim Bedri grabbing and slapping students who were reportedly protesting an increase in prices at the university’s canteen. University staff said it was filmed in 2013, according to Al Arabiya English, while students said this isn’t the only time that women have been assaulted at the school. At Sudan’s state universities, academic freedom and the quality of education has suffered gravely as faculty are pressured to reflect the current regime’s political Islamist ideologies. High-achieving students know that they have no chance of an academic post or scholarship unless they are part of the Islamist party. Private universities have meanwhile mushroomed across the country without standards or rules to hold them accountable to academic, moral and scientific standards. Some of these have also thrived in recent years on spreading and promoting militant ideologies and the repression of women, including Africa University in Khartoum, which recruits students from across the continent. This is the context in which Al-Ahfad University has positioned itself as a women’s rights institution, by virtue of its status as a women’s university. But the truth is that violence against women has been accepted for decades inside Sudanese universities, which generally lack meaningful laws and regulations to protect students – and Al-Ahfad is no different. At state universities, sexual harassment and violence is a subject of shame – and condemnation, thanks to a rich heritage of democratic student movements that have persisted despite years of repression, and that usually take strong, public stances on such issues. At private universities, this heritage does not exist, nor do robust policies to protect students. Al-Ahfad University emerged out of demands for women’s rights to education. Professor Bedri’s grandfather, a pioneering Sudanese entrepreneur, established the first secular school for girls in Sudan in the early 1900s. His courage opened doors for girls’ education in Sudan, against all odds, and laid the groundwork for Al-Ahfad, which was founded in 1966. In order to recruit students, Bedri the pioneering entrepreneur knew that he had to convince their parents first; he argued that the school would protect the girls, discipline them, and make them better wives and mothers. More than 100 years later, Al-Ahfad University carries the same mindset and ideology in its approach, imposing extreme guardianship measures on its students. Restricted activism and a feudal climate have resulted in open tolerance and acceptance of violence on campus. We must emphasise: just because it is a women’s university, connected to a history of demands for girls’ education, does not make Al-Ahfad a women’s rights institution. For more than 40 years, challenging female genital mutilation (FGM) has been the focus of Al-Ahfad’s positions on women’s issues. This sat well with international organisations, who have been complicit in constructing a distorted view of what it means to be a women’s rights institution in Sudan. Sudanese women have a long history of political and social struggle, that continues to this day. But most Western institutions reduce women’s rights and violence against women issues to the fight against FGM. Without a doubt, FGM is a violation of women’s and girls’ rights – but it is a symptom of a deeply-rooted culture that seeks to undermine and subordinate women by controlling their bodies, and this culture has been nourished and fed by ultra-conservative political regimes. In the 1970s and 1980s, FGM actually declined substantially in Sudan. At this time, the Sudan Family Planning Association and the Sudan Society of Obstetrics and Gynaecology adopted recommendations to abolish it. But in the 1990s, the practice gained new legitimacy and momentum with the emergence of political Islam in the region, which claimed it as an Islamic tradition. Girls in front of their home in north Sudan. Photo: Ayman Hussin.For the last 30 years, women in Sudan have been beaten by policemen under public order laws; family law has legitimised the assault of women by their husbands; survivors of sexual violence have no access to services or justice; pregnancy and a husband’s testimony are enough to accuse a woman of adultery, with possible punishments of execution or 100 lashes and imprisonment. It was therefore not surprising when the dean of Al-Ahfad University did not apologise or submit his resignation after the video of assaults against students emerged. Rather, in January he was quoted in the Sudanese newspaper Al Tayar saying: “disciplining women is part of our religion and culture” – reflecting the institution’s ‘guardianship’ role, and the current status quo in Sudan, not a commitment to women’s rights. 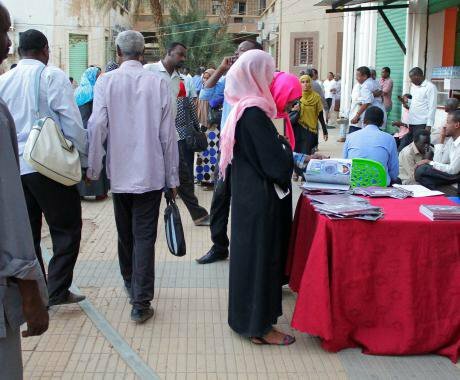 Activists and civil society groups have tried, often unsuccessfully, to obtain support from international agencies to challenge sexual harassment within universities and workplaces in Sudan. The international position appears to be that Muslim women in a poor country like this should not prioritise such harassment, because issues like FGM take precedence. This is condescending and damaging to women’s movements in Sudan, which have fearlessly exposed sexual harassment and violence despite serious risks and repression. I am proud of these women and I salute their courage and their actions, which will be recorded in future history books and which have encouraged other young women across the country to speak out. In early February 2018, six girls from the University of Khartoum stepped forward to file formal complaints against a law professor at the school, alleging sexual harassment, attempted assault, and threats of academic penalties unless they provided ‘sexual favours.’ This professor is still teaching, despite an ongoing investigation into his conduct by university management. Sexual harassment and violence do not only affect women and men in rich countries. We must reject and stand firmly against any attempts to legitimise this behaviour through religion or culture, and any attempts to normalise it. Such attempts must be exposed and confronted fearlessly, around the world.